^ Garwin & Lee 1997. ^ 5.0 5.1 Chiang 2014, pp. 3–5. ^ 7.0 7.1 7.2 7.3 McGrayne 1998, p. 254–260. ^ Wang 1970–80, p. 364. ^ 12.0 12.1 Weinstock 2013. ^ Chiang 2014, pp. 30–31. ^ 21.0 21.1 Chiang 2014, p. 43. ^ 22.0 22.1 Chiang 2014, pp. 44–45. ^ 24.0 24.1 24.2 24.3 24.4 Wang 1970–80, p. 365. ^ Wu & Segrè 1945. ^ 31.0 31.1 Chiang 2014, pp. 95–96. ^ 35.0 35.1 Wang 1970–80, p. 366. ^ 36.0 36.1 Chiang 2014, pp. 80–81. ^ Lee & Yang 1956. ^ 47.0 47.1 Chiang 2014, pp. 136–139. ^ Garwin，Lederman & Weinrich 1957. ^ Wu & Shaknov 1950. ^ Pryce & Ward 1947. ^ Dalitz & Duarte 2000. ^ 58.0 58.1 Chiang 2014, p. 166. ^ 59.0 59.1 Nelson 1997. ^ 62.0 62.1 Wang 1970–80, p. 367. ^ Chiang 2014, p. 111. ^ 66.0 66.1 Wang 1970–80, p. 368. ^ 72.0 72.1 72.2 72.3 72.4 72.5 72.6 72.7 Chiang 2014, pp. 228–231. ^ 74.0 74.1 74.2 74.3 74.4 74.5 Hammond 2007, pp. 100–102. 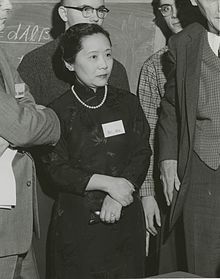 Chiang, T. C. Madame Chien-Shiung Wu: The First Lady of Physics Research. World Scientific. 2014. ISBN 978-981-4374-84-2 （英语）. 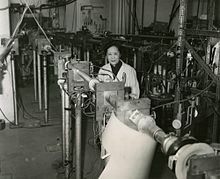 Cooperman, S. H. Chien-Shiung Wu: Pioneering Physicist and Atomic Researcher. Rosen Publishing Group. 2004: 39. ISBN 978-0-8239-3875-9 （英语）. Hammond, R. Chien-Shiung Wu: Pioneering Nuclear Physicist. Chelsea House Publishers. 2007. ISBN 978-0-8160-6177-8 （英语）. Heilbron, J. L.; Seidel, R. W. Lawrence and his Laboratory: A History of the Lawrence Berkeley Laboratory. Berkeley, California: University of California Press. 1989 [2015-05-24]. ISBN 978-0-520-06426-3. OCLC 19455957 （英语）. Wang, Z. Y. Wu Chien-Shiung. Dictionary of Scientific Biography 25. New York: Charles Scribner's Sons: 363–368. 1970–80. ISBN 0684101149 （英语）. Wang, Z. Y. Wu Chien-Shiung (PDF). New Dictionary of Scientific Biography 7. New York: Charles Scribner's Sons: 363–368. 2007 （英语）. Garwin, R.; Lee, T.-D. Chien-Shiung Wu. Physics Today. 1997, 50 (10): 120. Bibcode:1997PhT....50j.120G. doi:10.1063/1.2806727 （英语）. Benczer-Koller, N. Chien-Shiung Wu 1912–1997 (PDF). Biographical Memoirs (National Academy of Sciences). 2009: 3–16 [2015-05-05] （英语）. Wu, Chien-Shiung. The Continuous X-Rays Excited by the Beta-Particles of 32P. Physical Review. 1941, 59 (6): 481–488. Bibcode:1941PhRv...59..481W. doi:10.1103/PhysRev.59.481 （英语）. Wu, Chien-Shiung; Segrè, E. Radioactive Xenons. Physical Review. 1945, 67 (5–6): 142–149. Bibcode:1945PhRv...67..142W. doi:10.1103/PhysRev.67.142 （英语）. Wu, C. S.; Ambler, E.; Hayward, R. W.; Hoppes, D. D.; Hudson, R. P. Experimental Test of Parity Conservation in Beta Decay (PDF). Physical Review. 1957, 105 (4): 1413–1415. Bibcode:1957PhRv..105.1413W. doi:10.1103/PhysRev.105.1413 （英语）. Garwin, R. L.; Lederman, L. M.; Weinrich, M. Observations of the failure of conservation of parity and charge conjugation in meson decays: the magnetic moment of the free muon (PDF). Physical Review. 1957, 105 (4): 1415–1417. Bibcode:1957PhRv..105.1415G. doi:10.1103/PhysRev.105.1415 （英语）. Ambler, E.; Hayward, R. W.; Hoppes, D. D.; Hudson, R. P.; Wu, C. S. Further Experiments on Decay of Polarized Nuclei (PDF). Physical Review. 1957, 106 (6): 1361–1363. Bibcode:1957PhRv..106.1361A. doi:10.1103/PhysRev.106.1361 （英语）. Wu, C. S.; Shaknov, I. 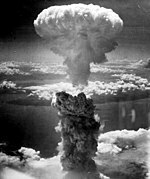 The Angular Correlation of Scattered Annihilation Radiation. Physical Review. 1950, 77 (1): 136. Bibcode:1950PhRv...77..136W. doi:10.1103/PhysRev.77.136 （英语）. Pryce, M. H. L.; Ward, J. C. Angular Correlation Effects with Annihilation Radiation. Nature. 1947, 160 (4065): 435. Bibcode:1947Natur.160..435P. PMID 20265544. doi:10.1038/160435a0 （英语）. Dalitz, R. H.; Duarte, F. J. John Clive Ward. Physics Today. 2000, 53 (10): 99. Bibcode:2000PhT....53j..99D. doi:10.1063/1.1325207 （英语）. Duarte, F. J. The origin of quantum entanglement experiments based on polarization measurements. European Physical Journal H. 2012, 37 (2): 311. Bibcode:2012EPJH...37..311D. doi:10.1140/epjh/e2012-20047-y （英语）. 吴健雄博士简介. 吴健雄学术基金会. [2016-02-28]. （原始内容存档于2014-01-29） （中文（台湾）‎）. 江才健. 吴健雄博士小传. 吴健雄学术基金会. [2016-02-28]. （原始内容存档于2014-06-03） （中文（台湾）‎）. 得奖荣誉纪录. 吴健雄学术基金会. [2016-02-28]. （原始内容存档于2014-01-29） （中文（台湾）‎）. 基金会缘起. 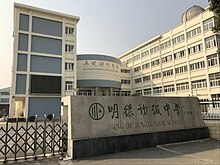 吴健雄学术基金会. [2016-02-28]. （原始内容存档于2014-01-16） （中文（台湾）‎）. 吴健雄科学营. 吴健雄学术基金会. [2016-02-28]. （原始内容存档于2015-06-17） （中文（台湾）‎）. 吴健雄. 中国网. 2010-03-04 [2015-08-16]. （原始内容存档于2015-11-03） （中文（中国大陆）‎）. The Nobel Prize in Physics 1957. Nobelprize.org. Nobel Media AB. [2015-03-24]. （原始内容存档于2016-02-02） （英语）. 吴健雄纪念馆. 吴健雄纪念馆. 2009-11-26 [2016-02-28]. （原始内容存档于2016-02-28） （中文（中国大陆）‎）. 生命的守望. 中国中央电视台. 2003-03-05 [2019-03-21] （中文（中国大陆）‎）. 焦桐. 与吴健雄教授相关的点滴回忆——写在吴教授百年诞辰前. 太仓市图书馆. 2012 [2019-03-21] （中文（中国大陆）‎）. 陆坤龙. 科学巨星陨落 献身精神不灭——吴健雄博士纽约追悼大会追记. 太仓市图书馆. 1997 [2019-03-21] （中文（中国大陆）‎）. 王大经. 一代物理女杰吴健雄骨灰回乡记. 太仓市图书馆. 1997 [2019-03-21] （中文（中国大陆）‎）. 杨慧. 美籍华裔科学家吴健雄与祖国大陆的亲情. 太仓市图书馆. 1997 [2019-03-21] （中文（中国大陆）‎）. Wu, C. S. Can We Save Basic Research?. Physics Today. 1975, 281 (12): 88. Bibcode:1975PhT....28l..88W. doi:10.1063/1.3069274 （英语）. Wu, C. S.; Moszkowski, S. A. Beta Decay. New York: Interscience Publishers. 1966. LCCN 65-21452. OCLC 542299 （英语）.